I can’t imagine there’s a better cremator, or a more service-oriented company. Hi Guys! Tim at Metro First Call in Minnesota here. Wanted to let you know that we cremated our largest body to date last week. A 6’1”, 703 pound, embalmed male. Our Classic-XCEL is an awesome machine. I just wanted to say Thank You for making Ivy Hill seem like we are your only client. Nothing seems to be a problem for you. You have given us service within 24 hrs. when needed,. It is evident that US Cremation Equipment and Ivy Hill have two common goals. We strive for efficiency and service to our clients. It is nice to work with a company that shares the same values. Just wanted to thank you and US Cremation Equipment for sending Chris out yesterday. It was very refreshing to have someone with exceptional knowledge of our equipment and someone who actually cares about our machine and wants to get it right! He did an excellent job getting machine tuned up as well as explaining issues that need addressed in the near future. Thanks again and please let Chris know that we truly appreciated his professionalism and hard work he put in yesterday. 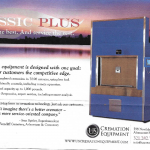 Looking forward to working with US Cremation Equipment in the near future! BIG Thanks again to everyone for their professionalism in helping us to get up and running. You and your team have been fantastic to work with. Thank you very much, we also appreciate working with U.S. Cremation Equipment and the way you and [your staff] are always easy to contact and quick to respond. Have a nice day. We shopped around with other manufacturers and U.S. Cremation was our choice. It’s a great machine. The service technicians are always prompt and thorough. Whenever we have questions, U.S. Cremation has the answers. Everyone has done an outstanding job for us, from truly listening to our needs to their round-the-clock availability. We have cell phone numbers, even for people at the top. They pointed out the features of their unit and never criticized their competitors’ products. They even encouraged me to check the competition. I did, but no one came close in expertise, support and customer service. I have never done business with a better company. After reviewing other equipment and examining the ‘Classic’, the choice was clear…the equipment is excellent, easy to operate and the after-sale service doesn’t end with the sale. It is a pleasure to do business with a company that treats you like a customer (and friend) instead of a number. Keep up the good work. With service like this, you can most certainly be assured that I am hooked. I will be using you guys for all my service needs. And, when it comes time for another machine it will be from U.S. Cremation. Their service is like no other I have experienced in this industry and I would highly recommend them to anyone looking to purchase an animal or human retort. Not only are their products second to none, but their service is what really sets them apart. In fact, I will be purchasing another machine from them in the near future. Overall I love the machine. In less than 4 months we have done 60 cremations without a problem.